"Once upon a time there was a dog who was loved very much. 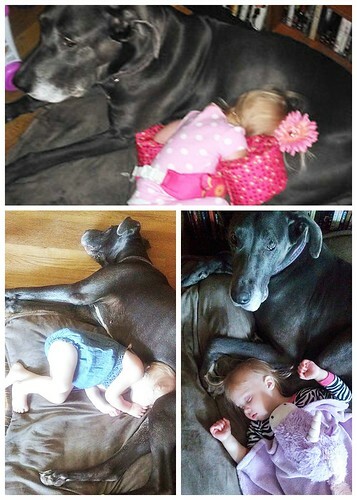 As that dog grew and grew, her family grew and grew. 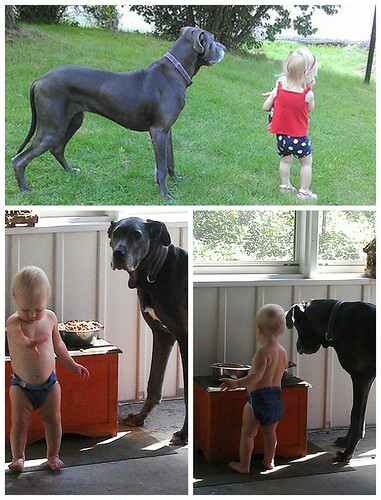 They spent countless hours racing around the backyard together. One million kisses and cuddles later, an entire decade had passed. They knew it was time to say goodbye, but it felt impossible to do. 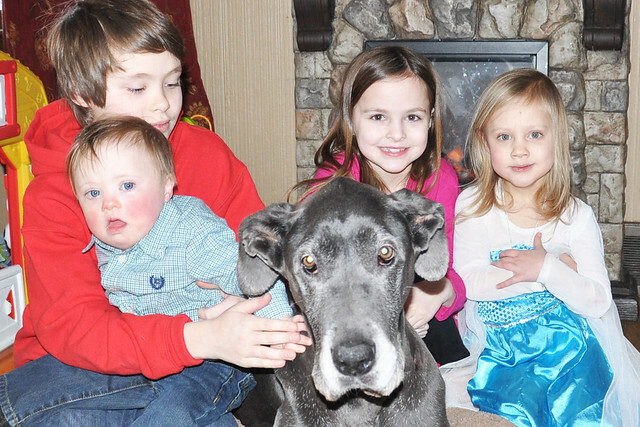 This sweet dog spent her last 24 hours cuddling with her family, posing for pictures, saying goodbye to friends, and eating lots of treats. She was THE best dog from the very start to the very end." Yesterday, Grant and I had to make the heartbreaking decision to put Bailey to sleep. My mind told me it was time, but my heart felt otherwise. Even so, the appointment was made for this afternoon. 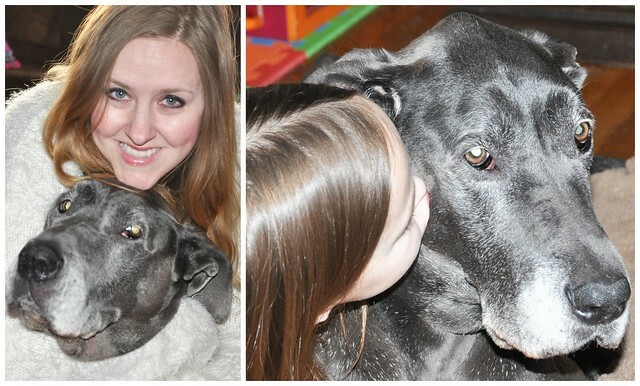 We were left with 24 more hours to spend with our sweet dog before we had to say our final goodbye. Bailey came into our lives in 2005, shortly after Dylan was born. 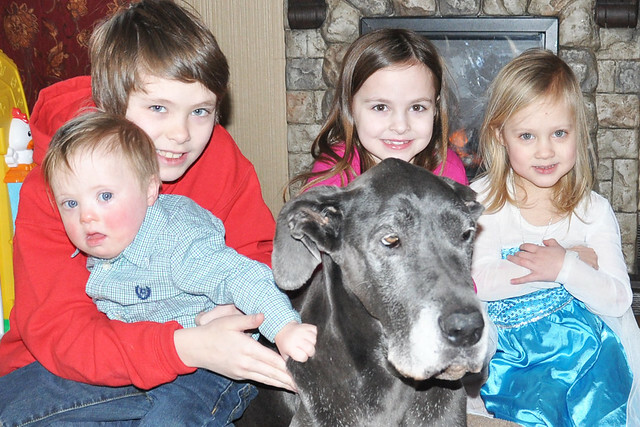 We were still grieving from the sudden loss of our previous Great Dane, Morgana. Months had passed since her death, and we were enjoying our new journey into parenthood, but something was missing. 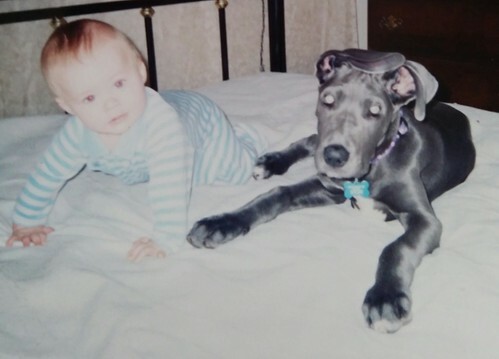 That something was a blue Great Dane named Morgana's "Bailey" Blue. Dylan and Bailey became instant best friends. They were both babies, and they grew up together. 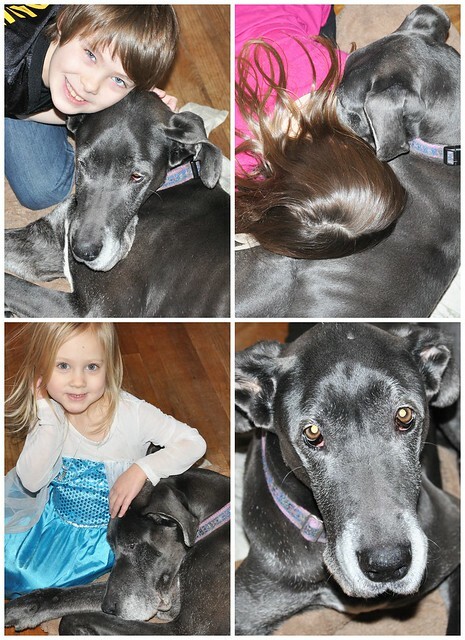 Bailey was the most loving and patient dog. 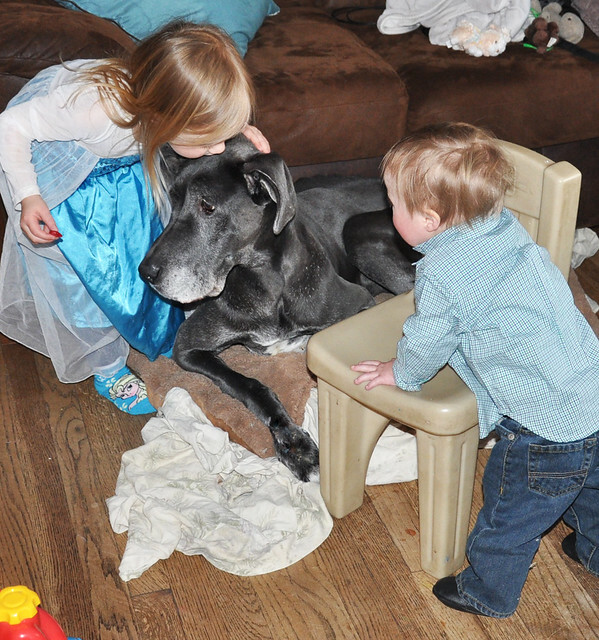 She loved kids and was ALWAYS gentle with them. 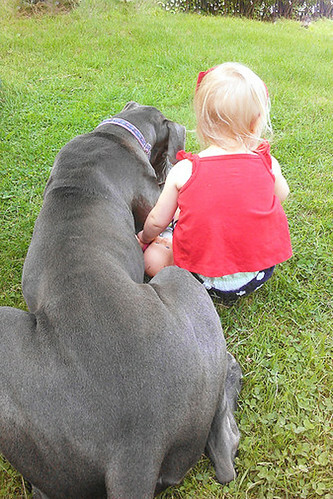 Great Danes are often called Gentle Giants, and she was definitely that. Over the next 10 years, three more kids joined our family. She loved each of them, and they adored her. She loved to go outside, run laps through our yard, chase the kids, and lay in the sun. We made some incredible memories during that decade that flew by in the blink of an eye. Bailey began to slow down and lose weight in the Fall. Cancer was most likely the culprit. 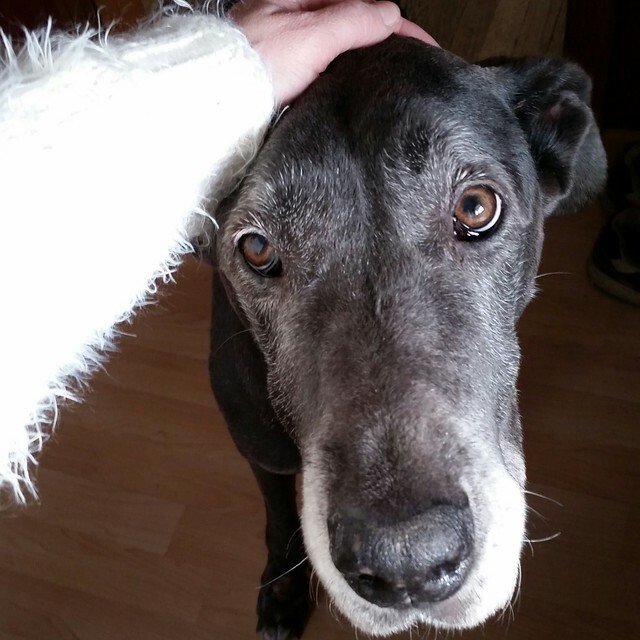 She was nearing the very end of her lifespan, so we decided to let her live the remainder of her life in her home, surrounded by the people who loved her. On Monday, it became evident that her time was near. The decision to end her life was the most difficult decision Grant and I have had to make. Even though I know we did the right thing, the guilt is consuming me. During her final 24 hours with us, we spoiled her and showered her with love. We made sure she knew just how much we loved her. We fed her tons of treats, and took some pictures. I am so grateful we had that time with her. We cried. We cried a lot. She had a normal day, and we tried extra hard to make it special for her. She stood by Liam's highchair as he ate, and I allowed her to sneak his food off his tray. She excitedly ran to the door when the doorbell rang. Friends came to visit and kiss her goodbye, and she ran out to greet them. We fed her pieces of lunch meat, stuffed chicken breasts, and an entire package of hot dogs. We snipped off a few patches of fur for a memory book. We rubbed her incredibly soft ears. We sat with her and hugged her as much as we could. It was a normal, special day, but incredibly sad. Dread began to build up inside of me as the clock ticked closer to 2:00. I took her outside for the last time, and watched as she stared up at the sky. Snowflakes landed on her soft, silver fur, and she turned to stare at me. I swear, she knew. 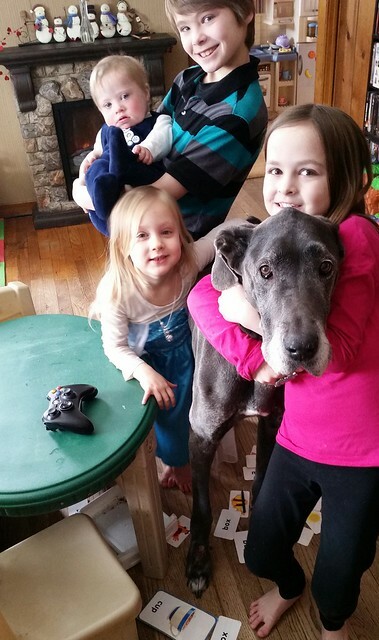 We attempted a final group picture of Bailey and the kids she loved most. My mom came over to watch Lexie, Lily, and Liam. Dylan rode in the back with Bailey, and my dad came along for moral support. When we arrived at the vet, after a scary, snowy drive, all I wanted to do was run back home with my dog, but I knew that was selfish of me. Before they took her back, Bailey turned and stared out the window one last time. At that point, I was positive she knew. They had to drag her away from us, which just made the pain so much worse. They quickly called us into the room to say goodbye. Dylan began to cry, said his last goodbye, then returned to the waiting room to sit with my dad. Then it was time. I wanted to tell the vet to stop. So many times. It truly is heart-wrenching. The pain of watching your beloved pet leave the world is something that stays with you forever. I wrapped my arms around her neck, put my forehead against hers and just kept telling her it was okay and that I loved her so much. Around 2:50 PM, she passed away in the comfort of my arms. Everybody left the room, and my tears turned to sobs. I held her as tight as I could, and rubbed her ears, face, back, sides, and feet, trying to remember every detail of our beloved dog. I wept over the dog who was a huge part of our lives for so long. She lived in our home almost as long as we owned it. She became a part of our lives shortly after we became parents. 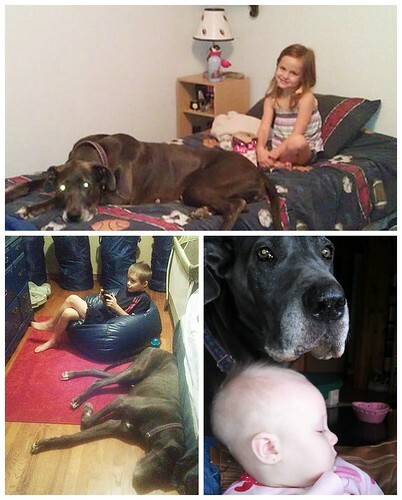 She welcomed three more children into our home and loved them just as much as she loved her Dylan. Our entire parenthood journey included Bailey. I wept because a decade went by faster than I ever imagined it could, and that decade told the story of her entire life. Letting her go was nearly impossible, but I finally said my last goodbye, said a prayer, and left the room. It hurts so much. I know it's nothing compared to the loss our friends experienced this week, but it still hurts. The house feels empty without her. This is the first time, since I was born, that my home has been pet-free. Several times tonight, I called for her, completely forgetting she was gone, and the tears began to fall again when she didn't come. Every time I close my eyes, I see her sweet face and her huge, puppy dog eyes. I always thought she looked like an uncoordinated, long-legged, gray deer. I can picture her as a puppy, picture her in her prime, and picture her as she looked today. Every time I picture her, she's outside, where she loved to be. I can't believe we won't ever see her in our backyard again, or play with her, hug her, or pet her. I can't believe she will never again excitedly run out to greet us when we get home. Unfortunately, saying goodbye is the most difficult aspect of owning a pet. They really do become part of the family. I know time heals and the pain will ease. I've had to say goodbye to two other beloved dogs. But the pain will never completely go away. There will be times when it hits so hard that it takes my breath away. I'm heartbroken. We're all heartbroken. She was so loved, and will be forever missed. Even though she's gone, she will always be with us. She will always be a part of our story. Rest in peace, Bailey. We love you forever. Oh my gosh, I just cried and cried. I have had such a terrible couple of days and have been strong, but reading this just broke something in me. I am so sorry for your family. What a beautiful story. Your post made me cry and I am so sorry you had to let her go - those decisions are never easy. 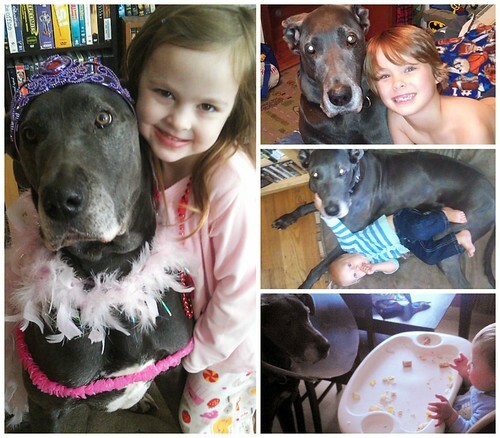 Bailey knew she was loved, how could she not with such a loving family. We are struggling with our Archie and I have come very close to making the same decision you had to make but we decided to wait. He has had health problems since puppy hood and if you could hear him cough you would wonder why we hang on. Archie is not old like your Bailey was so as long as he hasn't given up on himself yet, we can't give up on him either - but I feel your tears, I've already shed them for Archie many times. If it helps, you could make a book of Bailey through Shutter fly - have the older kids write something about her - add all those great picture you have - it would make a great memory book. This is so incredibly sweet and I'm crying like a baby. 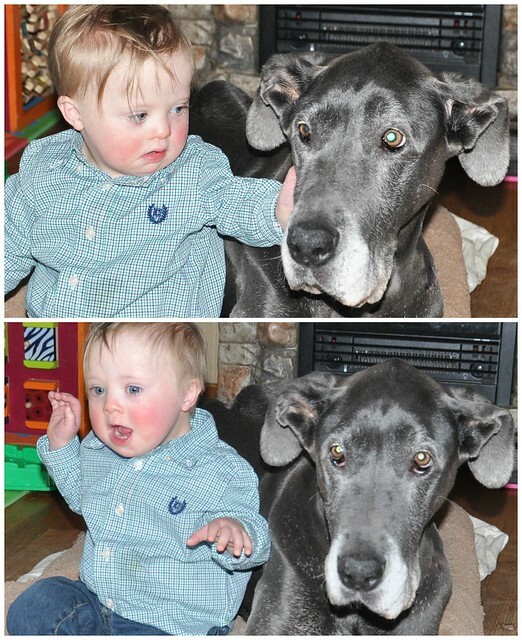 What wonderful memories you have with your beloved Bailey Blue! What a beautiful tribute post. I am so sorry. This is so hard to go through. 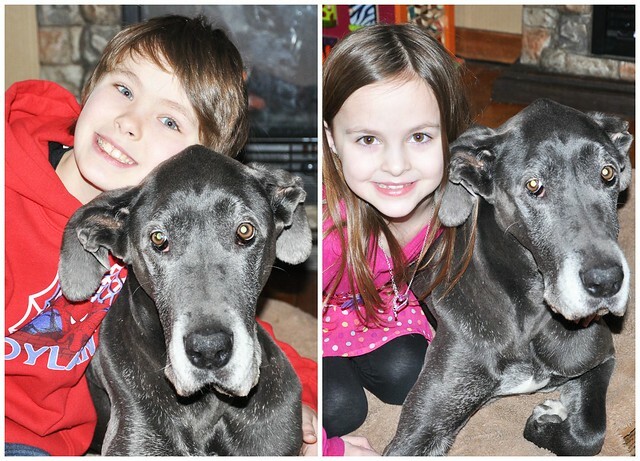 We laid my family dog to rest in 2009 and it's still brings back tears. Just remember you all have him the most beautiful life!! He was blessed by your family! I am so sorry to hear this, sending good vibes your way. I am so sorry for your loss!! I just had to make the same decision to put my precious lab to sleep and it was heart wrenching. Have comfort in knowing you did the right thing for your sweet girl. What a sweet, sweet tribute to her. I mourn with you and your family!! What a wonderful dog Bailey was! Oh my goodness - I don't know how I missed this post, but just read your 2015 recap and linked back to it. I am so so sorry for your loss. 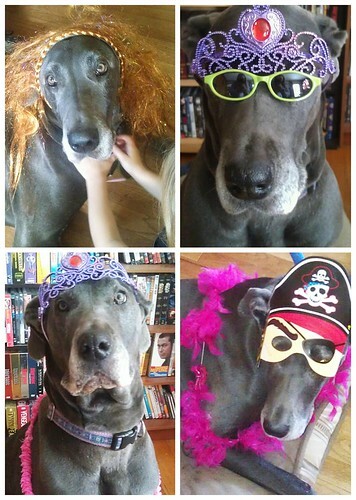 I've had dogs my entire life - we have three now & actually one is a Great Dane in fact. We had one growing up, too - they are the best dogs in the world. 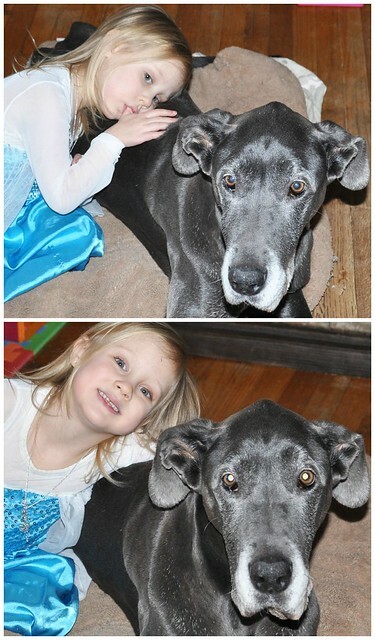 I've only had to put down one of our dogs, but it was in fact the hardest thing ever. Like you I kept wanting to say "No Wait!!" Because we grew up in the country many of our dogs took it upon themselves and went off into the woods to pass on their own - I think that was a gift to us b/c they made the decision for us. I cried reading your post and it brought back memories of having to do this myself. It is a tough thing to do, but in the end we have to know we are doing the right thing for our furry family members. Hugs to you - even 11 months later.